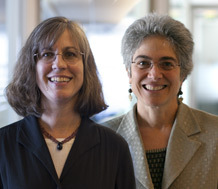 This post was written by Ruth Schoenbach (to the right of the photo) and Cynthia Greenleaf, Co-Directors of the Strategic Literacy Initiative at WestEd. We are excited to announce the availability of our new book, Leading for Literacy: A Reading Apprenticeship Approach, companion to our best-selling earlier book, Reading for Understanding. Reading for Understanding laid the foundation for Leading for Literacy by demonstrating how teachers and students in middle schools, high schools, and colleges could work together to boost literacy, engagement, and achievement in subject area classes using the Reading Apprenticeship framework. Leading for Literacy builds on that foundation by demonstrating the benefits of Reading Apprenticeship communities that extend a culture of literacy beyond individual classrooms. This new book guides teachers, teacher leaders, and administrators through the nuts, bolts, benefits, and stumbling blocks of creating such communities. We have had the good fortune of receiving federal and private funds over the past 20 years to test the efficacy of the Reading Apprenticeship framework. Nationwide classroom testing has shown that when teachers use this approach, they see marked increases in students’ motivation and positive academic identity, as well as in their ability to work with complex disciplinary texts. These increases result in better student outcomes that reach beyond classroom walls. In recent years, we’ve tested large-scale implementations of the Reading Apprenticeship framework across multiple states, grade levels, and subjects. The most consistent feedback we’ve received from teachers, teacher leaders, coaches, and administrators participating in these projects has been about how valuable it was — for themselves and for their students — to work as a community, with a common and consistent framework, strengthening literacy in various subject areas. Our new book includes many insights from Reading Apprenticeship practitioners across the country, addressing how to get started, build momentum, assess progress, and develop partnerships and networks across schools, districts, campuses, and regions. Leading for Literacy also explains how to generate authentic buy-in from teachers and administrators, use the Reading Apprenticeship Framework to turn reform overload into reform coherence, and create literacy teams, professional learning communities, and Reading Apprenticeship communities of practice that sustain an institutional focus on a student-centered, strengths-based culture of literacy. After you read the new book, we’d love to hear what you think of it. Please be in touch by contacting us here.